The Territorial Command of Madeira, through the Naval Section, the Territorial Post of São Vicente and the Tax Office of the Free Zone, yesterday, January 15, seized 129 kilos of fish in the total estimated value of 600 euros, in the localities of Funchal, Porto Moniz and Faial. Following a series of actions aimed at the surveillance of the coast and territorial sea, the military of the Naval Section of Madeira, detected a vessel in Faial, which was in the exercise of recreational fishing. In the approach it was possible to verify that the owner of the vessel, a 46-year-old man, had exceeded the daily catch limit, with a maximum of 20 kilograms allowed and 62 kilograms of fish on board, which a maximum fine of EUR 200. 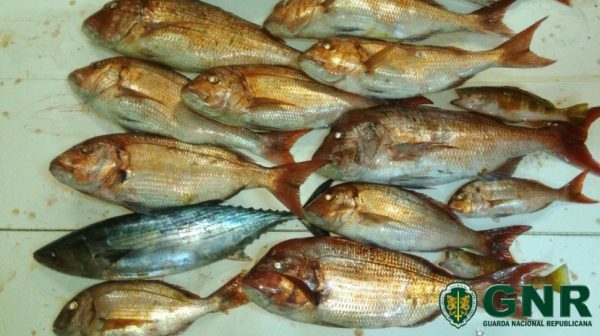 In addition to this infraction, the man had fished a 20-kilogram box, being prohibited the capture of specimens weighing more than 10 kg, due to the possibility of food poisoning by ciguatera toxin. The military proceeded to seize this fish as a precautionary measure and the specimen was delivered to the Services of the Regional Directorate of Fisheries for laboratory analysis. Also following this inspection, the military of the Tax Office of the Free Zone, detected a situation of escape to the lot in Funchal, having seized 47 kilos of mackerel and 14 kilos of mackerel. This infringement of fugue to the auction is punishable up to a maximum amount of 3 740 euros or 44 891 euros, depending on whether the infringer is a natural or legal person. In Porto Moniz, the soldiers of the Territorial Post Office of San Segovia detected the capture of limpets in the closed season, and 5 kilos of fresh limpets were seized, which after sanitary inspection were delivered to a social solidarity institution in the locality of São Vicente. The capture of limpets in the closed season is a punishable offense up to a maximum amount of 498 euros or 44 891 euros depending on whether the offender is a natural or legal person.